付燕刚, 唐菊兴, 胡古月, 高一鸣, 林彬. 新特提斯洋早期俯冲的岩浆岩记录及其成矿——西藏日喀则西北部花岗岩类锆石U-Pb年龄及Hf同位素[J]. 地质通报, 2018, 37(6): 1026-1036. Fu Y G, Tang J X, Hu G Y, Gao Y M, Lin B. The magma records and mineralization of early subduction of Neo-Tethyan oceanic slab: Zircon U-Pb and Hf isotopic composition of granitoids in the northwest of Xigaza[J]. Geological Bulletin of China, 2018, 37(6): 1026-1036. Abstract: The Late Triassic-Middle Jurassic magmatic rocks distributed sporadically in the south of Lhasa terrane are considered to be the magmatic records of the early subduction of the Neo-Tethys. In addition, Xiongcun porphyry copper system was associated with the magma. Therefore, research on the Late Triassic-Jurassic magmatic can help to evaluate its metallogenic potential. This pa-per reports LA-ICP MS zircon U-Pb age and in situ Hf isotopic compositions of the granodiorite in the northwest of Xigaza. The obtained U-Pb zircon age of the granodiorite is 175～180.1Ma. Zircon Hf isotopic compositions of the granodiorite display εHf(180.1Ma)=(+13.4), which shows the characteristics of mantle source with an affinity for island arc which was capable of forming the porphyry Cu-Au system. 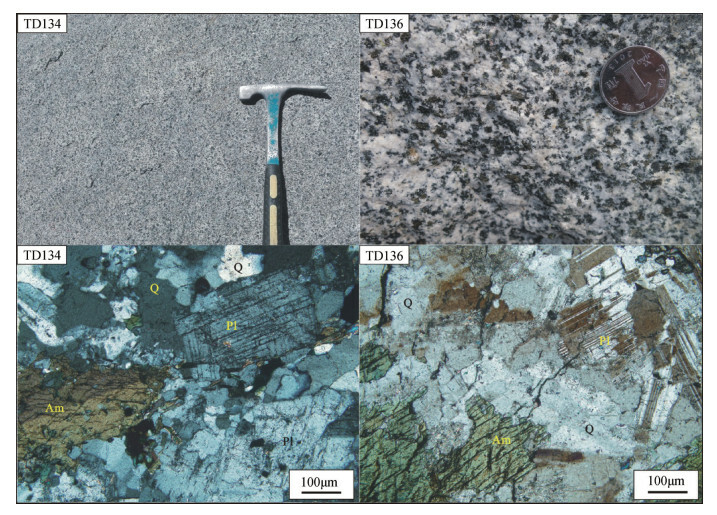 Therefore, the Late Triassic-Cretaceous volcanic rocks in the south of Lhasa terrane have the potential for exploration of the porphyry Cu-Au system. 莫宣学, 董国臣, 赵志丹, 等. 西藏冈底斯带花岗岩的时空分布特征及地壳生长演化信息[J]. 高校地质学报, 2005, 11(3): 281–290. Guo L, Liu Y, Liu S, et al. Petrogenesis of Early to Middle Jurassic granitoid rocks from the Gangdese belt, Southern Tibet:Implica-tions for early history of the Neo-Tethys[J]. Lithos, 2013, 179: 320–333. DOI:10.1016/j.lithos.2013.06.011. 朱杰, 杜远生, 刘早学, 等. 西藏雅鲁藏布江缝合带中段中生代放射虫硅质岩成因及其大地构造意义[J]. 中国科学(D辑), 2005(12): 1131–1139. Meng Y, Xu Z, Santosh M, et al. Late Triassic crustal growth in southern Tibet:Evidence from the Gangdese magmatic belt[J]. Gondwana Research, 2015, 37: 449–464. 唐菊兴, 黎风佶, 李志军, 等. 西藏谢通门县雄村铜金矿主要地质体形成的时限:锆石U-Pb、辉钼矿Re-Os年龄的证据[J]. 矿床地质, 2010(3): 461–475. Tafti R, Lang J R, Mortensen J K, et al. 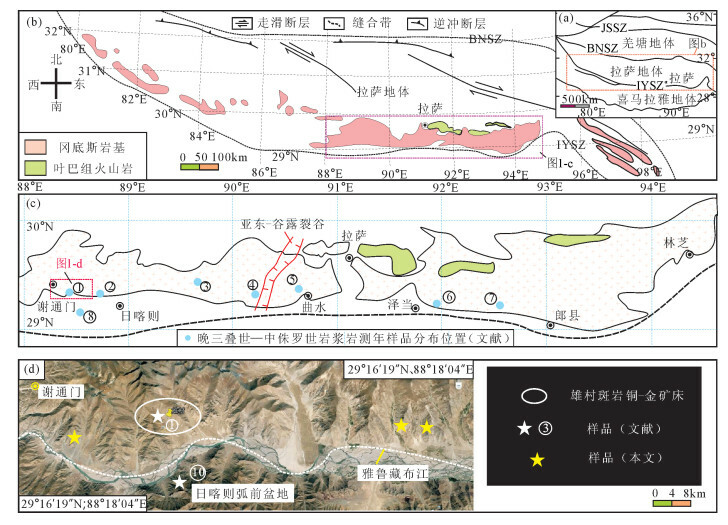 Geology and Geochronolo-gy of the Xietongmen (Xiongcun) Cu-Au Porphyry District, South-ern Tibet, China[J]. Economic Geology, 2014, 109(7): 1967–2001. DOI:10.2113/econgeo.109.7.1967. Lang X, Tang J, Li Z, et al. U-Pb and Re-Os geochronological evi-dence for the Jurassic porphyry metallogenic event of the Xiongcun district in the Gangdese porphyry copper belt, southern Tibet, PRC[J]. Journal of Asian Earth Sciences, 2014, 79: 608–622. DOI:10.1016/j.jseaes.2013.08.009. Tang J, Lang X, Xie F, et al. Geological characteristics and genesis of the Jurassic No. I porphyry Cu-Au deposit in the Xiongcun district, Gangdese porphyry copper belt, Tibet[J]. Ore Geology Reviews, 2015, 70: 438–456. DOI:10.1016/j.oregeorev.2015.02.008. Decelles P G, Robinson D M, Zandt G. Implications of shortening in the Himalayan fold-thrust belt for uplift of the Tibetan Plateau[J]. Tectonics, 2002, 21(6): 11–12. Ma L, Wang Q, Wyman D A, et al. Late Cretaceous crustal growth in the Gangdese area, southern Tibet:Petrological and Sr-Nd-HfO isotopic evidence from Zhengga diorite-gabbro[J]. Chemical Geology, 2013, 349/350: 54–70. 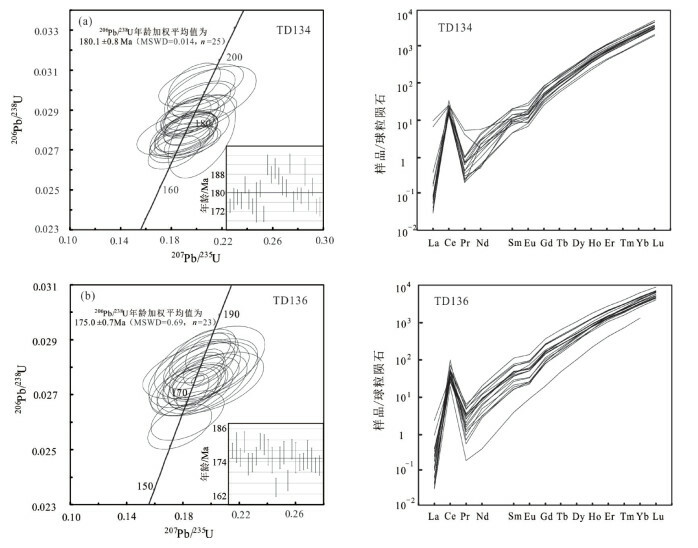 DOI:10.1016/j.chemgeo.2013.04.005. 尹安. 喜马拉雅-青藏高原造山带地质演化——显生宙亚洲大陆生长[J]. 地球学报, 2001(3): 193–230. 莫宣学. 岩浆作用与青藏高原演化[J]. 高校地质学报, 2011, 17(3): 351–367. Chu M, Chung S, Song B, et al. Zircon U-Pb and Hf isotope con-straints on the Mesozoic tectonics and crustal evolution of southern Tibet[J]. Geology, 2006, 34(9): 745. DOI:10.1130/G22725.1. 张宏飞, 徐旺春, 郭建秋, 等. 冈底斯南缘变形花岗岩锆石U-Pb年龄和Hf同位素组成:新特提斯洋早侏罗世俯冲作用的证据[J]. 岩石学报, 2007, 23(06): 1347–1353. DOI:10.3969/j.issn.1000-0569.2007.06.011. Meng Y, Dong H, Cong Y, et al. The early-stage evolution of the Neo-Tethys ocean:Evidence from granitoids in the middle Gang-dese batholith, southern Tibet[J]. Journal of Geodynamics, 2016, 94/95: 34–49. DOI:10.1016/j.jog.2016.01.003. Ji W, Wu F, Chung S, et al. Zircon U-Pb geochronology and Hf isotopic constraints on petrogenesis of the Gangdese batholith, southern Tibet[J]. Chemical Geology, 2009, 262(3): 229–245. 董昕, 张泽明. 拉萨地体南部早侏罗世岩浆岩的成因和构造意义[J]. 岩石学报, 2013, 29(6): 1933–1948. Kang Z, Xu J, Wilde S A, et al. Geochronology and geochemistry of the Sangri Group Volcanic Rocks, Southern Lhasa Terrane:Im-plications for the early subduction history of the Neo-Tethys and Gangdese Magmatic Arc[J]. Lithos, 2014, 200/201: 157–168. DOI:10.1016/j.lithos.2014.04.019. 耿全如, 潘桂棠, 王立全, 等. 西藏冈底斯带叶巴组火山岩同位素地质年代[J]. 沉积与特提斯地质, 2006, 26(1): 1–7. Zhu D, Pan G, Chung S, et al. SHRIMP zircon age and geochemi-cal constraints on the origin of lower Jurassic volcanic rocks from the Yeba formation, Southern Gangdese, south Tibet[J]. Interna-tional Geology Review, 2008, 50(5): 442–471. DOI:10.2747/0020-6814.50.5.442. 陈炜, 马昌前, 边秋娟, 等. 西藏得明顶地区叶巴组火山岩地球化学特征和同位素U-Pb年龄证据[J]. 地质科技情报, 2009, 28(3): 31–40. 陈炜, 马昌前, 边秋绢, 等. 西藏冈底斯带中段以东得明顶地区晚白垩世花岗岩类锆石U-Pb年代学和地球化学证据[J]. 矿物岩石, 2010, 30(1): 83–92. 黄丰, 许继峰, 陈建林, 等. 早侏罗世叶巴组与桑日群火山岩:特提斯洋俯冲过程中的陆缘弧与洋内弧?[J]. 岩石学报, 2015, 31(7): 2089–2100. Liu Y, Gao S, Hu Z, et al. Continental and Oceanic Crust Recy-cling-induced Melt-Peridotite Interactions in the Trans-North China Orogen:U-Pb Dating, Hf Isotopes and Trace Elements in Zircons from Mantle Xenoliths[J]. Journal of Petrology, 2010, 51(1/2): 537–571. Liu Y, Hu Z, Gao S, et al. In situ analysis of major and trace ele-ments of anhydrous minerals by LA-ICP-MS without applying an internal standard[J]. Chemical Geology, 2008, 257(1/2): 34–43. Anderson T. Correction of common lead in U-Pb analyses that do not report 204Pb[J]. Chemical Geology, 2002, 192(1): 59. Ludwig K R. User's manual for Isoplot 3. 00: a geochronological toolkit for Microsoft Excel[M]. 2003. Söderlund U, Patchett P J, Vervoort J D, et al. The 176Lu decay con-stant determined by Lu-Hf and U-Pb isotope systematics of Pre-cambrian mafic intrusions[J]. Earth and Planetary Science Letters, 2004, 219(3): 311–324. Wu F, Ji W, Liu C, et al. Detrital zircon U-Pb and Hf isotopic da-ta from the Xigaze forearc basin:Constraints on Transhimalayan magmatic evolution in southern Tibet[J]. Chemical Geology, 2010, 271(1/2): 13–25. Miller C, Thoni M, Frank W, et al. Geochemistry and tectonomag-matic affinity of the Yungbwa ophiolite, SW Tibet[J]. Lithos, 2003, 66(3): 155–172. Xu J, Castillo P R. Geochemical and Nd-Pb isotopic characteris-tics of the Tethyan asthenosphere:implications for the origin of the Indian Ocean mantle domain[J]. Tectonophysics, 2004, 393(1): 9–27. Mcdermid I R C, Aitchison J C, Davis A M, et al. The Zedong ter-rane:a Late Jurassic intra-oceanic magmatic arc within the Yar-lung-Tsangpo suture zone, southeastern Tibet[J]. Chemical Geolo-gy, 2002, 187(3/4): 267–277. 曲晓明, 辛洪波, 徐文艺. 西藏雄村特大型铜金矿床容矿火山岩的成因及其对成矿的贡献[J]. 地质学报, 2007, 81(7): 964–971. Hébert R, Bezard R, Guilmette C, et al. The Indus-Yarlung Zang-bo ophiolites from Nanga Parbat to Namche Barwa syntaxes, south-ern Tibet:First synthesis of petrology, geochemistry, and geochro-nology with incidences on geodynamic reconstructions of Neo-Te-thys[J]. Gondwana Research, 2012, 22(2): 377–397. DOI:10.1016/j.gr.2011.10.013. Aitchison J C, Badengzhu, Davis A M, et al. Remnants of a Creta-ceous intra-oceanic subduction system within the Yarlung-Zang-bo suture (southern Tibet)[J]. Earth and Planetary Science Letters, 2000, 183(1/2): 231–244. 张立雪, 王青, 朱弟成, 等. 拉萨地体锆石Hf同位素填图:对地壳性质和成矿潜力的约束[J]. 岩石学报, 2013, 29(11): 3681–3688. Hou Z, Lianfeng Duan Y L Y Z, Zhusen Yang, et al. Lithospheric Architecture of the Lhasa Terrane and Its Control on Ore Deposits in the Himalayan-Tibetan Orogen[J]. Economic Geology, 2015, 110: 1541–1575. DOI:10.2113/econgeo.110.6.1541. Liu D, Zhao Z, Zhu D, et al. Postcollisional potassic and ultrapotas-sic rocks in southern Tibet:Mantle and crustal origins in response to India-Asia collision and convergence[J]. Geochimica et Cosmo-chimica Acta, 2014, 143: 207–231. DOI:10.1016/j.gca.2014.03.031. Mao J W, Pirajno F, Xiang J F, et al. Mesozoic molybdenum depos-its in the east Qinling-Dabie orogenic belt:Characteristics and tec-tonic settings[J]. Ore Geology Reviews, 2011, 43(1): 264–293. DOI:10.1016/j.oregeorev.2011.07.009. Cooke D R, Hollings P, Walshe J L. Giant porphyry deposits:char-acteristics, distribution, and tectonic controls[J]. Economic Geolo-gy, 2005, 100(5): 801–818. DOI:10.2113/gsecongeo.100.5.801. Sillitoe R H. Porphyry copper systems[J]. Economic Geology, 2010, 105(1): 3–41. DOI:10.2113/gsecongeo.105.1.3. 梁华英, 魏启荣, 许继峰, 等. 西藏冈底斯矿带南缘矽卡岩型铜矿床含矿岩体锆石U-Pb年龄及意义[J]. 岩石学报, 2010, 26(6): 1692–1698. Jiang Z, Wang Q, Li Z, et al. Late Cretaceous (ca. 90Ma) adakitic intrusive rocks in the Kelu area, Gangdese Belt (southern Tibet):Slab melting and implications for Cu-Au mineralization[J]. Journal of Asian Earth Sciences, 2012, 53: 67–81. DOI:10.1016/j.jseaes.2012.02.010. 赵珍, 胡道功, 陆露, 等. 西藏泽当地区晚白垩世埃达克岩的发现及其成矿意义[J]. 地质力学学报, 2013(1): 45–52. Jiang Z, Wang Q, Wyman D A, et al. Zircon U-Pb geochronolo-gy and geochemistry of Late Cretaceous-early Eocene granodio-rites in the southern Gangdese batholith of Tibet:petrogenesis and implications for geodynamics and Cu ±Au ±Mo mineralization[J]. International Geology Review, 2015, 57(3): 373–392. DOI:10.1080/00206814.2015.1009503. 李金祥, 李光明, 秦克章, 等. 班公湖带多不杂富金斑岩铜矿床斑岩-火山岩的地球化学特征与时代:对成矿构造背景的制约[J]. 岩石学报, 2008(3): 531–543. 张志, 陈毓川, 唐菊兴, 等. 西藏多不杂富金斑岩铜矿床蚀变与脉体系统[J]. 矿床地质, 2014(6): 1268–1286.